To spotlight high-priority education issues, Regional Educational Laboratory (REL) Midwest collaborates with public television stations to produce 30-minute documentaries. These programs examine issues in depth and provide insights from research and experts in the field. In addition to airing these programs on local public television channels, posting them on YouTube, and creating viewing guides, REL Midwest hosts public screenings to engage educators in discussions concerning the content of the programs and the implications for their practice and their students. In Minnesota, our Midwest Career Readiness Research Alliance, which seeks to improve high school students’ career readiness and equity of access to career readiness opportunities, was interested in learning more about career readiness opportunities for rural students within the state. The alliance collaborated with Twin Cities Public Television (TPT) to produce the documentary “Ready for the Future: Career Preparation in Rural Communities.” Alliance members assisted in determining the program’s direction and provided advice on the content. The program draws on research to highlight factors and best practices that contribute to success for students as they plan for their futures. The documentary also features two evidence-based career readiness programs for rural Minnesota students: Creating Entrepreneurial Opportunities (CEO), offered by the Midland Institute for Entrepreneurship, and Scrubs Camp, run by HealthForce Minnesota. Since fall 2018, the documentary has been broadcast four times, reaching 27,600 households, and REL Midwest has since held two public screenings. On October 11, 2018, some 25 Minnesotans attended a screening at TPT’s studio in St. Paul. Those in attendance included researchers, state education agency administrators, principals, teachers, other school staff, and students. After viewing the documentary, attendees had the opportunity to discuss the content with practitioners and experts featured in the program, such as Paula Palmer, director of career and college success at the Minnesota Department of Education (MDE). The CEO program facilitator at Wadena-Deer Creek Public Schools, Cindi Koll, and HealthForce Minnesota executive director, Valerie DeFor, also were on hand to add to the conversation. Hearing from featured participants gave attendees a chance to take a deeper dive into the topic and learn more about research related to career readiness efforts in rural areas. The group found the discussion constructive. One attendee said, “I believe the group discussion was the most beneficial—it allowed further application to my personal life.” Another noted that the most beneficial part of the screening was “seeing the film examples followed by added context in conversation.” A third viewer shared plans to read more about rural career readiness efforts. 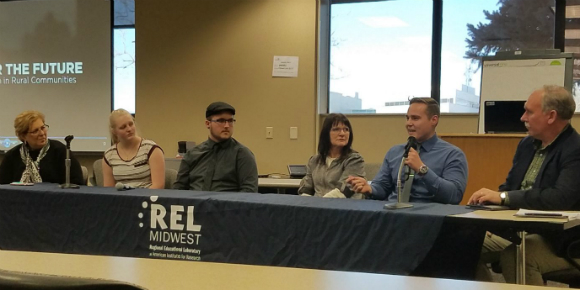 On January 25, 2019, REL Midwest screened the program at an MDE workshop focused on improving career and college readiness for all Minnesota students. In attendance were about 25 district and charter school administrators, teachers, counselors, curriculum leaders, and work-based learning coordinators. The screening was followed by a panel discussion, which included Palmer; Koll; Brady Malecha, K–16 project coordinator at HealthForce Minnesota; and two students from the CEO program. One attendee plans to use the documentary and the discussion questions in the related viewing guide [134 KB ] at an upcoming principals meeting. Dockendorf also plans to screen the program for his staff, noting, “The documentary is spot on, not only in discussing the issue head on, but in providing good examples. It reinforces everything we are working on at Big Lake High School and the partnership we have with the Big Lake community. Vogel mentioned that work-based learning is critical in rural Minnesota. For example, the CEO program, which gives high school students the opportunity to apprentice in their community, helps students stay connected, encourages them to work in the community, and keeps the community strong. Visit our website to learn more about the Midwest College and Career Readiness Research Alliance. Sign up for our newsletter to receive monthly updates featuring new posts from the REL Midwest blog!